The horse hasn't come to life yet. Time to wrap it up for today. I've put in another 8 plus hours but time seems to stand still when I work or maybe it's fly by? Perhaps it's both. 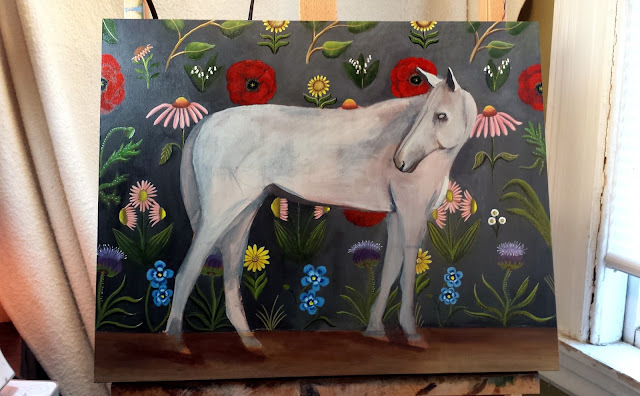 I was planning on doing a floral still life next however, I've decide to paint a white horse first. I haven't done a horse yet so I am excited. ( I've done a zebra ) When these ideas pop into my head I need to go with them. It will be a similar composition as my black bear. 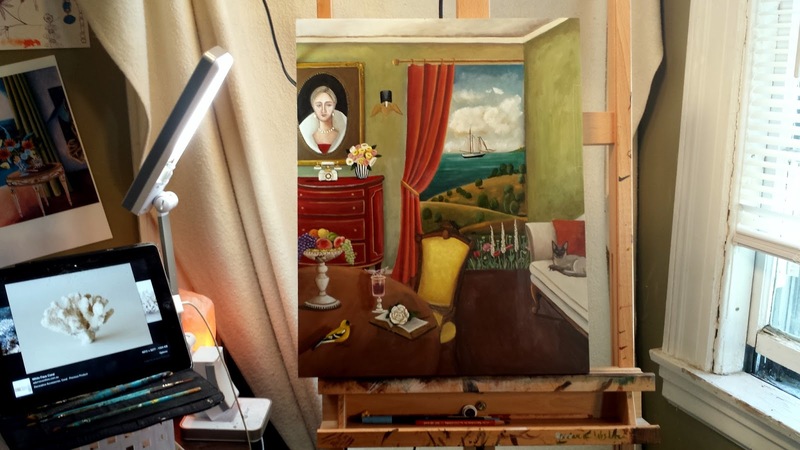 I love to pair the contrasting backgrounds with the solid focal point. 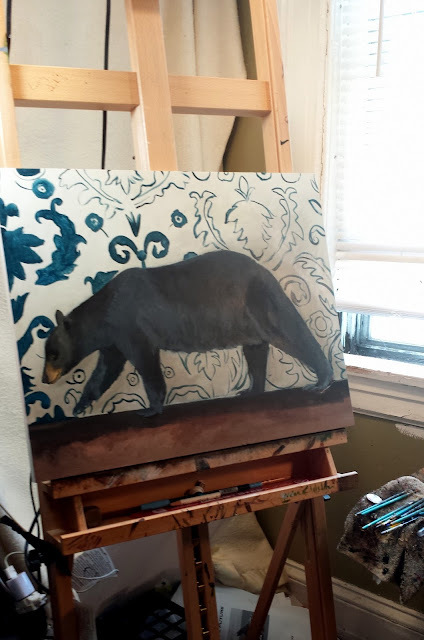 I'm working on 16x20 surface. White horses are born white and stay white throughout their lives. White horses may have brown, blue, or hazel eyes. 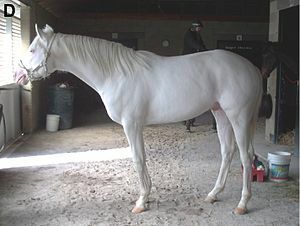 "True white" horses, especially those that carry one of the dominant white (W) genes, are rare. Most horses that are commonly referred to as "white" are actually "gray" horses whose hair coats are completely white. Throughout history, white horses have been mythologized in many cultures. For example, Herodotus reported that white horses were held as sacred animals in theAchaemenid court of Xerxes the Great (ruled 486-465 BC), In more than one tradition, a white horse carries patron saints or the world saviour in the end times, including Hinduism, Christianity, and Islam. Completed on June 27. Pandas, Polar, Brown and Black I've painted one of each now . This is my latest piece which is 16x20 on a cradled wood panel with painted sides. Thanks for stopping by. This painting is for sale through my website. Here's a peek at my latest painting. I am in animal mode. Earlier this week, my neighbor required my assistance in rescuing a robin which had become caught in some fishing line. The string was tightly bound to it's delicate feet. While my neighbor held this beautiful bird, I very carefully snipped around it's little feet. It was amazing to see a wild bird up close for me. A few weeks earlier on my way home from visiting Sam, 3 baby ducklings ran across the busy road without their mother obviously off course. I stopped,along with another woman, and we brought them back to the pond and waited a while but the mothers was no where to be found. An owl and then a blue heron flew by it was dusk so rather than leave them we brought them to the animal hospital. Inspiring but nothing to do with bear right? 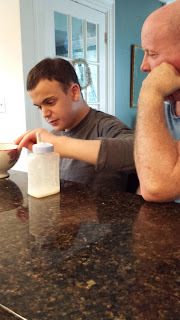 It's been a long time since I have mentioned Sam my son who is now 22 and living in a group home the next town over. 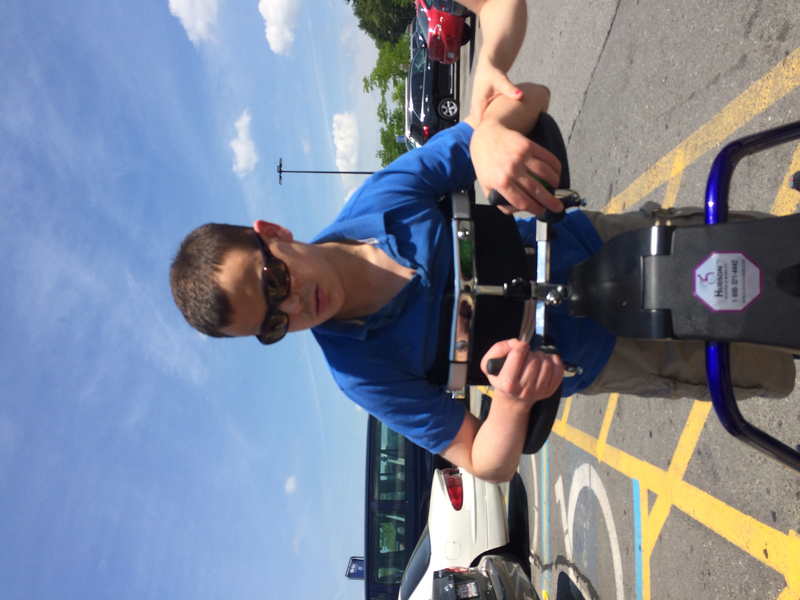 I must report that Sam is doing better than ever before. He had been through some really challenging times last year and I am so grateful for his improvements. I still continue to make all his food since his special diet is so complex, which gives me great peace of mind. Like my big sister told me yesterday -I don' t know what tomorrow will bring but for today I am happy and at peace for this day. I wish you the same. Completed on June 21- True love does wait. That can mean many things. I will leave that up to the viewer. This painting was a journey and a joy. The photograph never quite captures the crisp details. 16x20 on cradled birch wood panel with painted sides. Thanks for stopping by. I have been spending a lot of time on this new piece and it looks like I will be wrapping it up on Monday now. I try not to work on the weekends, especially when the weather is so amazing and life is happening all around me, but I just can't stop thinking about this piece! ! It is evolving into something very different then what it started out as, which is fine by me. This is one of those paintings that has it's own agenda if you will. (By the way it's 16x20) There is still some interesting twists yet to happen. Stay tuned. Thanks for stopping by. Hope your weekend is great. Happy Friday! "Where Are You Going?" just completed this morning. Don't you just love dachshund dogs? They are a favorite breed of many artists and poets. My little Theo made his way into the draw as well. Swallows are a symbol of hope and care so I love to paint them. This piece is 12x16 created on a cradled wood panel. I especially love the colors and highlights. On another note thought I'd share "Where I am going tomorrow"- my oldest son is getting married in the fall and tomorrow is the bridal shower so I am happy to be finishing up early today! Have a wonderful weekend. www.catherinenolin.org to view on my website. Allow one week before shipping.